Welcome to your 3 bedroom holiday home in the heart of 1066 country. Lesley and Graham thank you for viewing our Deluxe graded ABI Horizon static caravan. We both have a history of working in the hospitality industry and our aim is to bring you some hotel style luxuries and extras not normally found in other caravans. Our hospitality is being imitated by others but not equalled (according to the amazing feedback and reviews we have received). NEW FOR 2019 - YOUR FIRST BREAKFAST INCLUDED - cereal, fruit juice and breakfast pastries are provided with our compliments. Traditionally we also provide your Welcome Cuppa (tea, coffee, milk, sugar) and biscuits, complimentary toiletries, fresh fruit and confectionary. Also included in the price of your stay are all pillows, duvets, linen and towels (for use in the van only please). We have updated interior decor and soft furnishings and provide chairs, table and a picnic rug, cool bag and block for your use outside should you wish to eat and drink al fresco or take these on a day trip out. We want your stay in 1066 country to be as pleasurable and relaxed as possible and, as we live locally to the van, we can be on hand to deal with any queries you may have during your stay. Our caravan is a two minute walk from the main complex but is still in a quiet location on the Park. We both look forward to welcoming you. 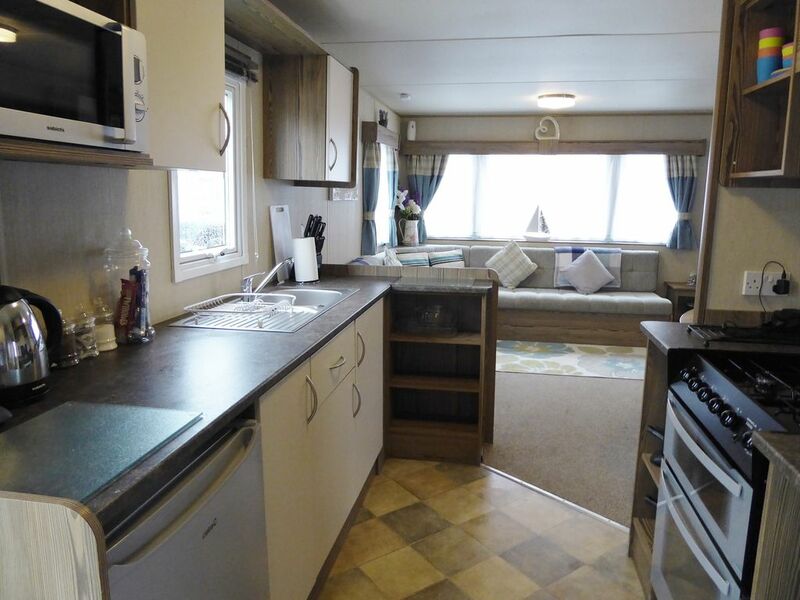 Measuring 36 x 12 feet our caravan offers spacious accommodation for all the family to enjoy a break away. The van is light and airy and has net curtains throughout to ensure your privacy. All windows are double glazed. Gas is mains connected and so there is no inconvenience of having to change cylinders. Gas and electricity supply is included in the price of your stay. The lounge area has contemporary furnishings and seats at least 8 people comfortably. There is plenty of modern wood effect cupboard and shelf space. A Freeview 32 inch television and dvd combi is installed for your use. A cosy gas fire is installed in case the evenings get chilly. The dining table with additional sofa seats and stools means that everyone in your group can eat in comfort and the coffee table converts into a handy tray in case you wish to have breakfast brought to you in bed! There is a fully equipped galley kitchen area with gas oven and four ring gas hob, microwave, toaster, kettle and fridge with freezer compartment. There is ample crockery, cutlery, saucepans, bowls, dishes, utensils, glass tumblers and wine glasses for your use during your stay. We also provide a handy kitchen basket including washing up liquid, cleaning liquid, cloth and sponge and a tea towel and paper kitchen roll for your use. The bedrooms consist of three doubles - one with double bed and two with 2 single beds each. There is also a double pull out sofa bed in the lounge so that a total of 8 people could sleep in the van (please advise us if you intend to use this so that we can provide additional linen). All bedrooms have warm air heating. Bedrooms have cupboards/wardrobes with hanging and shelf space and bags/cases can be stored under the beds. We also supply a hairdryer for your use. The shower room is well appointed with wc and handbasin and heated towel rail; in addition there is a further separate wc and handbasin in the caravan for convenience all round! The bathrooms have obscure glazing and brushed silver metal venetian blinds for extra privacy. Loo rolls are provided. Our caravan is situated within the popular Combe Haven Holiday Park which has a host of activities for all ages. There are plenty of eating and drinking choices on Park including the Mash and Barrel Bar and Restaurant, The Saxon Centre with Sky Sports and Ball Park for the little ones, Burger King and Pappa Johns (who will deliver a pizza direct to your caravan). There is a mini market on site with freshly baked goods and all the provisions you need to self cater. Guests can use all of the eating and drinking facilities without passes but some activities do require passes which can be purchased on site. We do not include Fun Passes in the price of our caravan as this helps keep the accommodation cost down for our guests and allows them the choice of what they wish to do during their stay at the Park. We both have a history in the hospitality industry. Lesley moved to Hastings from London in 1968 when her parents bought a hotel on the seafront in St. Leonards on Sea and she has lived here ever since. We just love living with the sea and see it every day. Wanted to buy a holiday home and fell in love with our "van" as soon as we saw it. We had searched all over the UK and found the answer right on our doorstep eventually. This brings back memories of childhood going to holiday camps with our parents. But WOW!!! it is so different and modern now. We go there every week and spend £1 in the arcade and have a burger. We also stay over as often as we can - it is like going on holiday just around the corner! We aim to make this a unique stay for our guests, bringing the hotel holiday experience to a caravan at an affordable price. Loo Rolls, towels and toiletries provided. Shelf space and bin. Warm air heating in bedrooms, gas fire in lounge. WiFi on Park but not available on all devices in the carvan. Fully equipped with crockery, cutlery and glasses. Comprehensive range of cooking utensils, boards, saucepans, glass ovenware and much more. Cutlery, mats and coasters provided. Plastic plates, bowls, beakers and straws provided for the little ones. 32" TV/DVD combi. Sky Sports available at the Saxon Centre. A selection of traditional games available in the caravan. Available in the Mash and Barrel bar and eatery. First I’d like to start by saying how lovely the caravan was, clean and was made to feel so homely. Lesley and Graham had thought of everything. The kids bedroom was made up in childrens bedding and it really made a difference. My son slept on his own for the first time whilst staying in a caravan. I 100% would return! If you ever get the chance to stay here then you won’t be disappointed. It was wonderful! Thank you for the lovely review and for leaving the caravan so clean and tidy. We like to make the caravan experience extra special for all our guests. You are welcome back at any time. Great communication from start to finish with leslie and Graham. They really cpuld not have done more to ensure pur stay was comfortable and enjoyable. They provided so many extras for us and our children which really made the stay so lovely. Would love to go back and stay again. Thank you for your great review - we are so glad you enoyed your stay and the extras we provide. Thank you for leaving the caravan so clean and tidy. A delightful family who are welcome back at any time. I would absolutely recommend this property, as it has everything you could possibly need, and is really well located to allow you to explore the surrounding area. Graham and Leslie could not have been easier to deal with, and they made the whole process super easy, and everything was very well organised. If we ever return to this area, we would absolutely love to stay here again. Thank you for your lovely review Kevin and Pendella. We are so pleased your family enjoyed your stay and appreciated the amenities and presentation of the caravan. Thank you also for leaving the caravan so clean and tidy. Delightful guests who are welcome back at any time. Extremely comfortable and cosy with added extras!! Highly recommended, we had an amazing short break! On arrival, Graham met us personally and gave a tour of the caravan. We were impressed by how very clean and well equipped it was! Graham was very friendly and ensured us that he was only a phone call away should we need anything. The caravan was more than big enough to accommodate 3 adults and a 2 year old and the added extras (biscuits, sweets, toiletries, milk, tea/coffee and fresh fruit on arrival) were very welcome after a long trip down. The beds were extremely comfortable and, although a little chilly at night, the thick duvets and fire in the living room definitely ensured we were kept warm enough! The caravan was easy to find with ample parking outside. We will definitely look at booking another break here again soon! Thank you Laura for your great review - we are so pleased you enjoyed your stay at the caravan. We take great pride in the presentation of the holiday home and have a vision of making caravan holidays extra special for all of our guests. Thank you for leaving the caravan so clean and tidy - you are perfect guests who will be welcome back at any time. We were met at the property and welcomed by Lesley and Graham, a lovely couple who explained everything. The home was bright, airy, comfortable and very clean. There were plenty of extras including a lovely fruit platter, biscuits and confectionary. We were a family of 4 adults with everyone wanting their own space and we even had an extra loo. I found the double sofa bed really comfortable and all the bed linen was good quality. Lesley and Graham were very friendly, kind and attentive and were more than willing to assist with any help we needed. The park is in a great location with friendly onsite security, just a few minutes drive down to the seafront and a mile or two from the lovely pier and the town. We didn't really use the onsite facilities but did walk around and there seemed to be quite a few things for families to do including a nice pool. Thank you Lesley and Graham for being so kind to us. We would recommend staying here and hope to be back next year. Thank you for your great review. We are so pleased you enjoyed your stay with us. We take great pride in the presentation of the caravan for all our guests and your appreciation of the extras we provide makes it worthwhile. You are great guests (especially your Mum who is charming - and knows how to cook proper roast "tatties"! ), you are welcome back at any time. Thank you also for leaving the holiday home so clean and tidy. We had an amazing stay. On arrival we were met by Graham and Lesley who showed us around the caravan and talked through everything. The first thing we noticed was how clean everything was. We also appreciated all of the little extras like the fruit bowl, welcome cuppa and yummy biscuits. We will be back and would definitely recommend this holiday home to others. Thank you for your lovely review and we are pleased you had a great stay. We take great pride in the presentation of the caravan for all our guests. Thanks for leaving the holiday home so clean and tidy, you will be welcome back at any time. Situated in the Combe Haven Holiday Park, St. Leonards on Sea. This Park has entertainment and facilities for all ages whatever the weather! For fun there are the three heated pools (one indoor and one outdoor plus a kids pool), Live Lounge and Bar for entertainment, golf (9 hole), climbing frames and indoor soft play area, archery, reed bed and nature reserve (loads of exploring here), pool and darts, and numerous sports and leisure activities. For eating at Combe Haven there is the Mash and Barrel Bar and Restaurant, Burger King, Pappa John's Pizza (who will deliver to your caravan for free), and Convenience Store. Please note many activities are free to all guests - passes for others may be purchased at main reception for others.